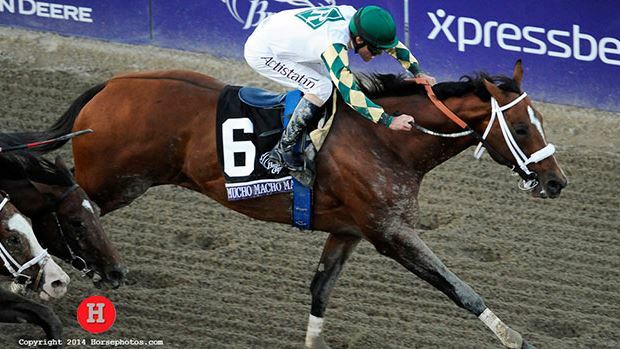 NEW YORK CITY (Friday, January 17, 2014) – Mucho Macho Man’s nose victory in the $5 million Breeders’ Cup Classic has been voted by fans the 2013 National Thoroughbred Racing Association (NTRA) Moment of the Year. The results of the online poll were announced this morning at the second annual ThoroFan Awards Breakfast at Gulfstream Park Racing & Casino in Hallandale Beach, Fla.
Mucho Macho Man, owned by Reeves Thoroughbred Racing, went off at 4-1 in the Breeders’ Cup Classic, a race he had finished second in the previous year. Jockey Gary Stevens, who earlier in 2013 had come back from seven years of retirement, urged Mucho Macho Man to the lead approaching the top of the stretch and saved enough to barely hold off late charges from Will Take Charge and Declaration of War in a wild three-horse photo finish. Heart transplant survivor Kathy Ritvo became the first female trainer to win North America’s richest race, rewarding Patti and Dean Reeves for the faith they showed in both her and the popular hard-trying horse, who had never won a Grade I event until the second half of 2013 despite several close tries. Balloting was conducted at the NTRA Web site, ntra.com, and offered voters 12 different images illustrating a range of human emotions as well as outstanding displays of equine athleticism. Finishing second was Paynter’s winning return to racing following a miraculous recovery from colitis and laminitis; the popular Grade I winner’s near-fatal illness earned topped the 2012 Moment of the Year voting. The first-ever “NTRA Moment of the Year” was the touching scene between Charismatic and jockey Chris Antley following the 1999 Belmont Stakes. The next year’s winner was the stretch run of the 2000 Breeders’ Cup Classic, which saw Tiznow hold on for a dramatic victory against Giant’s Causeway. Tiznow won again the following year as fans selected his stirring repeat victory in the Classic over Sakhee. In 2002, fans cited the passing of the last living Triple Crown winner, Seattle Slew. In 2003, the popular Kentucky Derby win by Funny Cide was selected. Birdstone’s upset win in the Belmont Stakes over Smarty Jones took down top honors for 2004. In 2005, fans selected Afleet Alex’s spectacular victory in the 2005 Preakness Stakes. Voters in 2006 chose Barbaro’s gallant struggle to recover from his Preakness injury while at the New Bolton Center. The 2007 Moment of the Year was a historic victory by filly Rags to Riches over Curlin in the Belmont Stakes. In 2008, it was Zenyatta’s win in the Breeders’ Cup Ladies’ Classic. Zenyatta “repeated” in 2009 as fans selected her triumph in the Breeders’ Cup Classic. In 2010, fans selected Blame’s narrow Breeders’ Cup Classic victory over Zenyatta. Drosselmeyer’s hard-fought win over Game on Dude in the Breeders’ Cup Classic was the public’s choice for 2011. Last year, the recovery of Haskell Invitational winner Paynter from near-deadly battles with laminitis and colitis captured the hearts of voters like no other story.